Shake Shack, founded in Manhattan, opened its first Philadelphia-area location in 2012 in Center City. 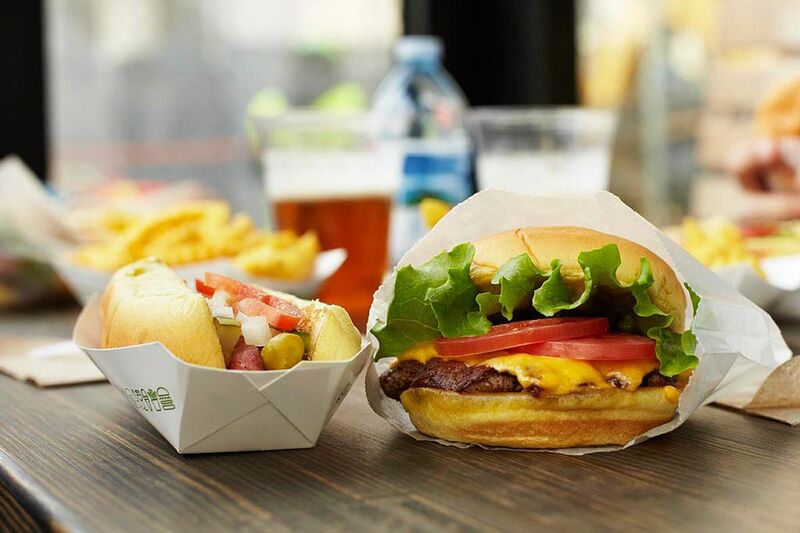 Shake Shack, Danny Meyer's New York-rooted better-burger chain, is on a roll of late. A Shack opened last month in Marlton Commons in Evesham Township. That makes six locations in the Philadelphia metro — including 20th and Sansom Streets in Center City (which opened in 2012), two at King of Prussia Mall, 3200 Chestnut St. in University City, and one inside the Wells Fargo Center. Number 7 is on the way. A recent community zoning hearing raised no opposition to a Shack at the southeast corner of 12th and Chestnut Streets, which was last Philly Cupcake (it closed in 2015). The eatery also will take an adjacent jewelry store. A Shack rep said a late-2018 opening is expected. Doug Green of MSC Retail, who represents Shake Shack's real estate interests in the Philadelphia market, said the intersection "represented the confluence of everything Shake Shack looks for in an urban location — strong daytime population, seven-day-per-week shopping cotenancy, and a neighborhood that is in high growth mode" for residents. Paige Jaffe of CBRE represented the building owner. The site is a block from the East Market development and the forthcoming Fashion District Philadelphia (nee The Gallery). Target, PetSmart, and Fine Wine & Good Spirits are on the same block. Food-wise, the area is home to new locations of Honeygrow, Luke's Lobster, Wrap Shack, and Devon & Blakely (plus Mom's Organic Market) on 11th Street, and it's a block from MilkBoy. The former Philly Cupcake at 12th and Chestnut Streets, before its closing in summer 2015.